Sharon Graham Interview with Bruce Duffie . . . . . . . . .
Sharon Graham is one of the select few singers who was in the right place at the right time, and is now  where she wants to be in her career. After studying voice privately in California, she was accepted into the Lyric Opera Center for American Artists. There, she learned and performed a wide range of roles both in the studio, and on the mainstage with Lyric Opera. 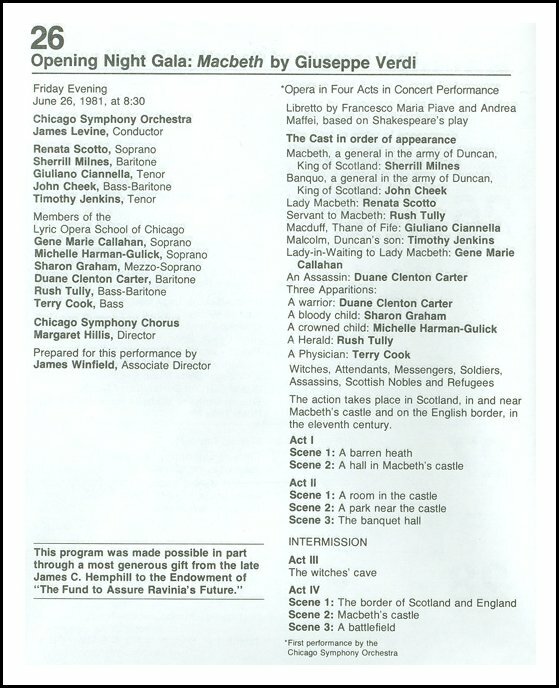 the Ravinia season in June of 1981. Graham selects her roles carefully and makes just the right number of appearances each season. Luckily for Chicago, she returns regularly to allow us to watch the career blossom now that she is out of the nest. 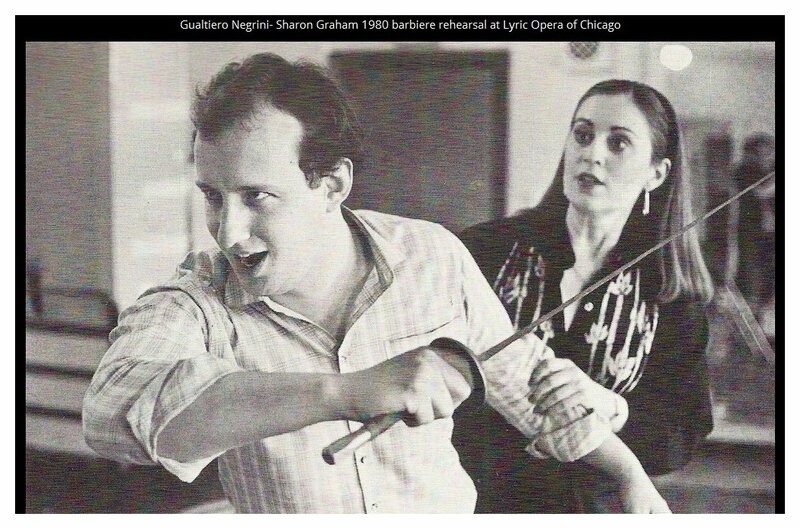 It was in the fall of 1982, while she was still with the Opera Center, that I had the opportunity to chat with Sharon Graham. She was very busy — indeed after our conversation she was off to another rehearsal. Balancing those demands against the pressures of performing regularly was just one of the topics we discussed. We pick up the interview with a potentially fatal question . . . . . . . . .
Bruce Duffie: You are a mezzo-soprano. Have you any aspirations to be a soprano? Sharon Graham: When I first came here, half the time was spent asking “is she a mezzo? Is she going to stay a mezzo? 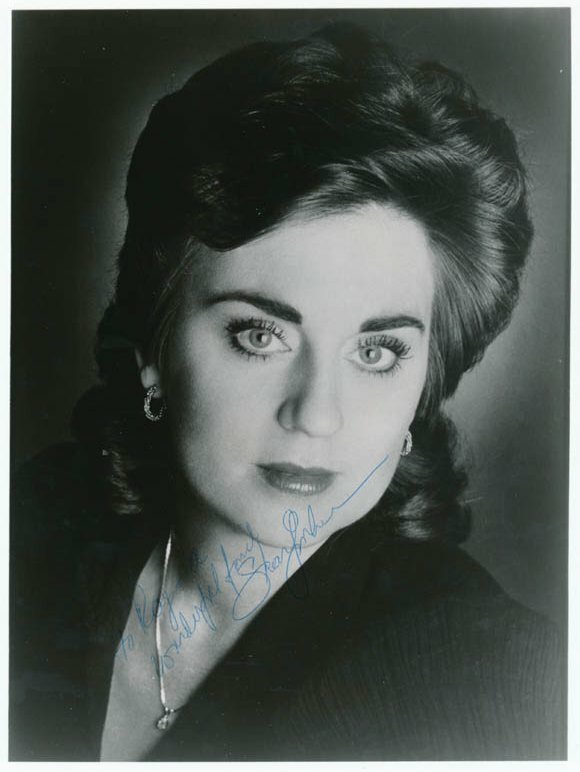 Is she going to be a dramatic soprano?” I finally gave up thinking about it because Carol Fox (then the General Manager of Lyric Opera) happened to ask Luciano Pavarotti which way I should go. He said, “Who cares? Just have her sing the way she sings and the future will take care of itself!” And that’s really the way I feel about it. I am not going to try to sing any repertory I don’t feel comfortable with just to try to be a soprano. We have shining examples of people who have done that and ruined their voices. BD: Within that framework, how do you decide which roles you will and will not sing? SG: Mostly by how comfortably they feel vocally and emotionally and psychologically. That has a lot to do with it. Many of the roles I do are very high, like the Composer in Ariadne Auf Naxos. That has a very high tessitura, but it’s only the one act and so you don’t have to sing that tessitura for three hours, which makes a big difference. I have looked at a couple of soprano things, and I have the notes, but it doesn’t feel comfortable, so why try to do something I don’t feel comfortable with? But it’s pretty easy to decide. When you sing through it and you feel like your throat’s about to fall out, then the question has been answered. Being dramatic and short is one thing, but if it goes on for hours and hours, then I wouldn’t consider it. BD: Would you do a role that you didn’t like psychologically if it fit your voice perfectly? SG: I did Cenerentola, and vocally it’s marvelous for me, but psychologically it was really hard to be the Cinderella-type — naïve and sweet and doing whatever my stepfather said, and gazing at the prince for days. That was kind of hard, but it worked out all right. BD: Would you rather play a more evil kind of character? SG: Not evil, but someone who is more multi-faceted. It’s easy for Cinderella to be a “Poor-me, martyr” character right up until the very end. I keep going back to the Composer, which I could sing every night. Psychologically, he’s just fabulous. He’s thinking three pages ahead of everyone else, and the music is wonderful, too. When Lyric did Ariadne in 1981, I sang Driad but covered the Composer, and both of the people who were engaged for the part did not come until the orchestral dress rehearsals. So I sang all the staging rehearsals and all the music rehearsals, and I really did the part. 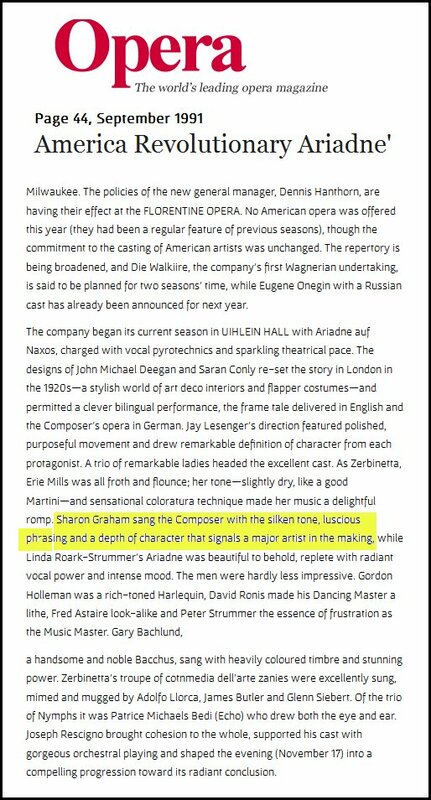 The following year, I got to sing the role (in English) with the Illinois Opera Theater. BD: Does that opera work well in English? SG: The Prologue does because the text is so important. The Prologue goes by so fast, and is so hilariously funny that if you don’t understand it you really miss a lot of what’s going on. There’s all the interplay. But then you get the problem of diction because the part is so high in a lot of places. BD: Do you work harder at your diction when you’re singing in English? SG: No, because it’s also extremely difficult in German. I worked on the entrance line for about two weeks because it’s so fast and your mouth is trying to chew into these words, and it was my first German part and my first trouser-role and my first Strauss role! BD: Do you like playing a boy? SG: I like playing good parts, and the Composer is definitely one. I can’t wait to sing Octavian. Some boy-parts I don’t really care to sing just because they’re not me. Cherubino I’ve sung once and I probably won’t do it again because it’s just not suited to me vocally or mentally. But I like parts where I can really stretch myself. With the Composer you find something new every phrase every time you hear it. It’s so fresh and written so beautifully and orchestrated so beautifully. The text by itself is just a delight to read. BD: You are a rather beautiful woman, so how do you go about playing a boy? SG: Costuming helps a lot, and many women, when they play boys, do too much and they look masculine. If you get the walk down and think the part, it comes out a lot better than trying to look “macho” and spread your legs and throw your arms a lot. If you’re convinced yourself inside your heart and mind, it will come across. That’s the hardest part — whatever your character is — finding it in your heart and your mind. Once you find it, you don’t have to do a lot of extraneous movements. If you believe it, the audience will believe it; you just have to find it somewhere. BD: Are we putting too much emphasis on the drama in opera? SG: I think you can. It has to be a meeting of the theater and the music. Let’s face it, it’s a singing drama, so the singing has to be of primary importance. Some stage directors are kind of oblivious to the problems of singers — asking you to sing to the back wall or to the wings. You just say “yes, maestro” and position yourself so you can sing out. BD: Do you enjoy singing opera, or would you rather do concerts? SG: That’s one thing that I miss. I love doing recital work, I really do. It’s so demanding because you don’t have the mask of the staging and costumes, and you don’t have the pit between you and the audience. It’s very difficult to do song-repertory well, and I miss that a lot. But I’ve been so busy here at Lyric that I just haven’t had time to do anything like that. BD: Are the students in the Opera Center kept too busy? SG: I have turned things down this year because I’m just up to my eyeballs with things to learn. It’s wonderful and I certainly wouldn’t trade it, but I’m very busy. BD: Is there anything you would change about your curriculum? SG: I wouldn’t change anything at all from my point of view. For me it has been such an incredible opportunity. At the same time, it has not been good for a lot of people who have been here. Opportunities have a lot to do with it. The first year that I came here was 1979, and there just happened to be tons of mezzo parts. So I lucked out and sang more my first year than I have any year until this one (1982). The timing was right, and I was prepared to take the opportunities that were given tome. BD: So you’ve been here four years. Is that enough — or too much? SG: There again, it changes for every person who’s here. I came in with zero experience. I didn’t come from a conservatory where there’d been an opera workshop. I came from studying the voice privately in California, so it was a very different place in my preparedness for a career than other people have. Others come in with lots of experience and are here just to polish up and be part of the Lyric experience and go on. BD: Did you spend all your life in California? SG: I was raised in Michigan, but I came in the winter of 1979 when Chicago had never had that much snow! So I had my first introduction to Chicago and the professional world in one fell swoop! BD: Do you do anything special to protect the voice in cold weather? SG: Nothing more than just take good care of myself — wrap up and stay warm. BD: Do you feel like you’re an athlete? SG: Yes, very definitely, and I love it. My teacher told me once that if I could do anything else in the world and be happy, I should because there are such tremendous sacrifices in this business, and that’s really true. You sacrifice stability and family life, and many times children... not always, but it’s very difficult especially if you’re a woman in this career to find someone who is stable enough and secure enough to handle being Mr. Female Opera Singer. It’s a very demanding business and it’s a total commitment, and it’s hard to find someone that can understand that. BD: Are you getting asked to sing the things you want to sing? SG: Not everything, of course, but the things I’m being asked to do are things I want to do. BD: Do you get asked for things you don’t want to do? SG: Yes, and I’m not doing those. They’re one extreme or the other — either too small or way too big. BD: Even at this early point in your career, are there any roles you have come back to? SG: Yes, Rosina in The Barber of Seville. I did it two or three years ago and I did it again this year, and it had grown so much. I found it really helps to learn something and then put it on the shelf and pull it out again later. Even though you haven’t been studying that role, it grows because you grow and your technique hopefully gets better. BD: Was it easier or just more fun? SG: Both. I wasn’t going, “Oh my God, here comes that page that’s so hard with all those notes. How can I do it?” When I came back to the role, I could play with it in a way that I never could before, and it was a lot of fun. It was my first coloratura part, and I was scared of it. BD: Do you feel that the coloratura takes away from the drama of the piece? SG: No. I don’t think you can be a singer of good quality if you can’t sing coloratura. You have to be able to have the flexibility and agility to add beauty. Anybody can sing loud, but loud is boring after about two minutes, and if that’s all you can do, the people will go to sleep. There’s nothing more beautiful than a pianissimo phrase or a coloratura passage that’s well done, but you also have to be able to do dramatic music. BD: Are auditions good for young singers? SG: That’s a big question. Sometimes they are good, and sometimes they are very damaging. It’s so hard to have a good audition attitude, especially where they’re trying to pick “the best singer.” It’s like trying to pick which rose is the most beautiful. Past a certain point it’s all personal taste, and it’s difficult to be rejected and still remember that you are a very good singer and that you are worthwhile, and that just because this person doesn’t like you doesn’t mean that you’re not good. It’s very heard. A lot of people audition extremely well and just cannot perform on the stage, and some people perform beautifully but don’t audition well. Auditions do their job well on their terms, and the problem is that you have to fit into someone else’s idea of what “good” is. You may be wonderful, but if they don’t happen to like you, it’s tough. They still will have chosen the right person by their set of criteria, but you are not among those who have been chosen. BD: What influence on you as a singer are recordings? SG: They’re a mixed blessing. Opera recordings have done a great deal of harm as far as audiences go. They can create a lot of false expectations. A famous singer told me of doing 26 takes of a certain aria for a recording, and people go to the theater and expect to hear the same thing. BD: Is a cut-and-piece-it-together recording a fraud? SG: Maybe, but I would do the same thing if given the opportunity, so I don’t know. I can see re-taping something if you’re not pleased with it, but to use two bars from here and the cadenza from there is really not right. Some of the best recordings I’ve heard are from live performances, and you have the extra feeling as well. There are the flaws and noises, but it still is more real than a studio recording. BD: How much do you get involved in the “business” side of your career? SG: I want to be very much aware of what’s going on, but I don’t want to have to do it myself. I’ll let the agent handle things and just try to be an artist. January 06, 1986|By Richard Christiansen, Entertainment editor. On such a note, just before the start of Sunday`s matinee, customers were greeted in the lobby of the Civic Opera House for the first staging in Lyric Opera`s last cycle of ``Madama Butterfly`` performances for this season. Less triumphant and certainly more placid than the Bears` playoff victory, this production of Giacomo Puccini`s opera nonetheless had its own shards of newsworthiness for its customers. Chief among these were the Lyric Opera debuts of Yoko Watanabe, a Japanese-born soprano, in the title role, and Ermanno Mauro, an Italian tenor, as her faithless lover, Lt. Pinkerton. Watanabe, who quite naturally has made a reputation for herself in this role in European opera houses, brings to it a slender figure, an occasional touch of poignance in her acting and a voice that, starting out reedy and shrill in its upper registers, warmed up into a strong instrument in the second act. Unfortunately, for her first performance in this production, she also kept her eyes glued on conductor Miguel Gomez-Martinez in the pit, no matter what events were taking place on stage. This had the effect of giving her portrayal the air of a one-woman dramatic recital, with the other singers and actors vainly trying to relate to her. When the stolid little Christopher Michael Pessetto came out in the second act as her young son, he didn`t look at her either, but just calmly scratched one of his ears while she sang straight ahead and past him in her final aria of grief. As for Mauro, he is a sturdy tenor with a voice that carries forcefully over the footlights and a personality that just lies there. Besides the two principals, this season`s-end re-entry of ``Butterfly`` into the Lyric repertory also had several supporting roles taken by singers other than those who had opened the season last fall with the initial performances. Mezzo-soprano Sharon Graham, vocally and dramatically strong as Butterfly`s devoted servant Suzuki, has a clear, powerful voice that sounds as if it`s on its way to much bigger roles. And the veteran Sesto Bruscantini brought a welcome poise to the theatrics of the proceedings in his role as Sharpless, the U.S. consul at Nagasaki. Back again were the peppy little Florindo Andreolli, in his checked suit, as the sly marriage broker Goro; Catherine Stoltz as Pinkerton`s blond American wife; Paul Kreider as Butterfly`s rejected suitor Prince Yamadori; and John Del Carlo, in his florid Kabuki makeup, as her angry uncle. Director Harold Prince`s generally handsome production in the classic Japanese style, first seen in 1982, still suffers from overkill in the gimmicky use of its turntable scenery, which after a while begins to remind one of a revolving restaurant at the top of a motel. The real standouts of this performance were Gomez-Martinez and the Lyric orchestra, who drew abundant drama and beauty from Puccini`s peerless score. In the minds of most opera goers, the term American opera tends to mean ``Porgy and Bess'' and not much else. Connecticut Opera's charming and poignant production of Douglas Moore's ``The Ballad of Baby Doe,'' which opened at The Bushnell Thursday night, will serve as a powerful corrective. Until Thursday night, the opera had been seen in this city exactly once, in a touring version 37 years ago. In light of its attractive music, colorful setting and, most of all, its stirring and ultimately heart-tugging story -- all the more effective for being true -- it perseveres that the opera still lives only at the edge of the active repertoire. Then again, a few more productions like this one and that may change. For those who haven't been paying attention, ``Baby Doe,'' written in 1956, tells the story of Horace Tabor, a Vermonter who, in the middle of the 1800s, went to Colorado seeking gold, but who found silver. Rich and celebrated, Tabor divorced his wife of nearly three decades and married Elizabeth ``Baby Doe,'' a transplanted Midwesterner and herself a recent divorcee. In the end, the bottom falls out of the silver market and Tabor is ruined. But Baby Doe, the one- time ``miners' sweetheart,'' faithfully stands by her man, broke and broken. Almost everything about this presentation was good. The production itself was a joy: Willie Waters' crisp and sensitive conducting, Ellen Schlaefer's deft understated direction, the handsome sets (borrowed from ``Chautauqua''), the sumptuous costumes, imported from Seattle. But it was the singers who really ignited the show. As the company has acknowledged, this production was explicitly mounted for soprano Mary Dunleavy, as Baby. Dunleavy was worthy of the gesture. From her ``Willow Song,'' (in which, for the record, she soared easily to a high-D) to her scalp- tingling goodbye to her dying husband, Dunleavy was in complete control, vocally and dramatically. It was another triumph in her amazing, and ever lengthening, Connecticut Opera legacy. As the swaggering but oddly sympathetic Tabor, Kimm Julian turned in a richly varied performance, highlighted by his riveting, hallucinatory final scene. Thom King did a fine turn as the silver-tongued presidential candidate William Jennings Bryan, to whose star Tabor disastrously attached himself. Anna Maria Syilvestri, a commanding singer who is also a born actress, furnished most of the evening's humor as Baby's plain-spoken mama. But in many ways, it was Sharon Graham, as Tabor's cast-out first wife, Augusta, who proved to be the show's central heart and dramatic fulcrum. In the remarkable scene in which Augusta warns Baby of Horace's impending fall, and later, in a regretful soliloquy near the end of her life, Graham's performance was nothing short of phenomenal. The choral work was strong (it's some of the show's nicest music) and there was solid singing from the Tabor daughters, played by Elizabeth Schmidt and Courtney Ryan. 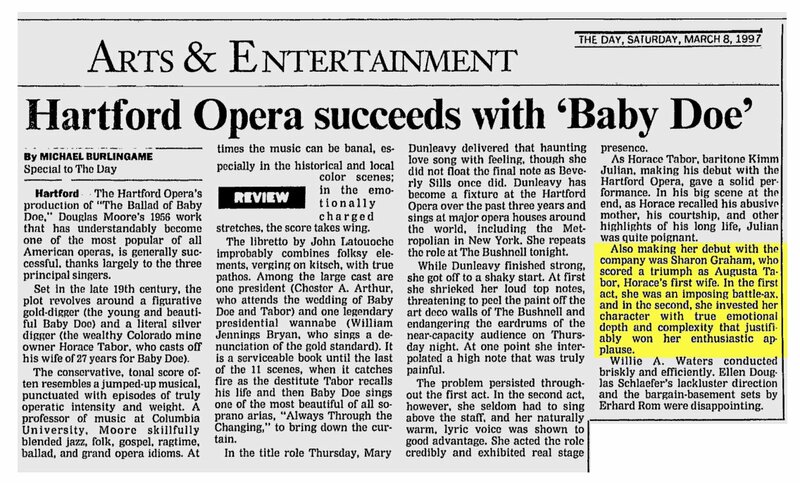 But ``Baby Doe'' is a great evening in the theater. And great evenings in the theater are not so easy to come by that we should have to wait 37 years between them. THE BALLAD OF BABY DOE -- music by Douglas Moore, libretto by John Latouche; directed by Ellen Douglas Schlaefer; conducted by Willie A. Waters; scenery design by Erhard Rom for Chatauqua Opera; costume design by Kurt Wilhelm for Seattle Opera; lighting design by James Franklin; chorus master, Neely Bruce. 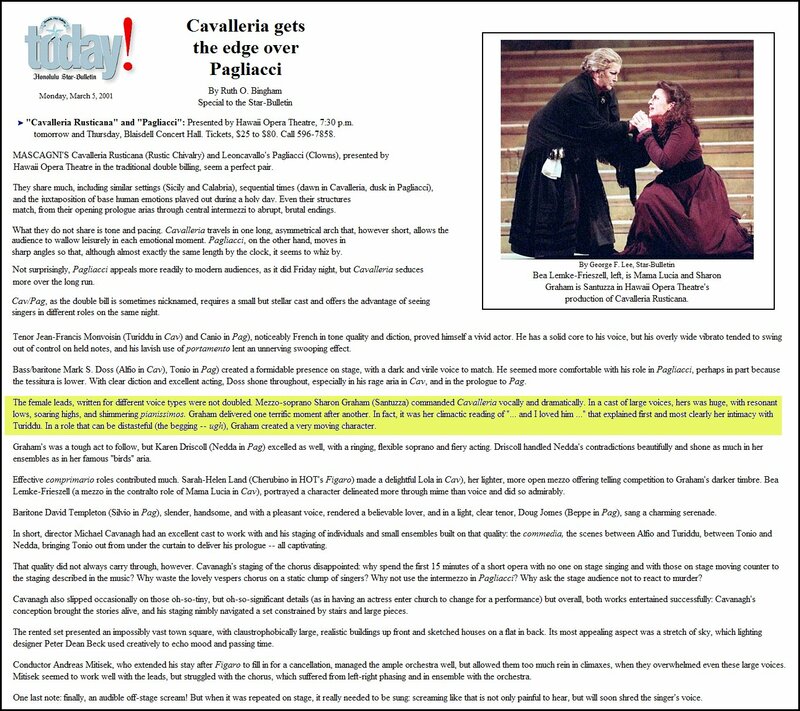 Presented March 6 and 8 at The Bushnell in Hartford by Connecticut Opera, George Osborne, general director. This conversation was recorded in Chicago on November 16, 1982. The transcription was made it was published in The Opera Journal in December of 1986. It was slightly re-edited, the photos and liks were added and it was posted on this website in 2016.